← He is a 30/30 Club Member: But How Good Was Eric Davis? As I approached my adolescence my fancies turned to horses, then to acting, but I NEVER gave up on my Cubbies. I had very liberal, artistic parents (who were White Sox fans) and they allowed me to experiment with all sorts of daydreams…..but who did I dream about most? My Boys in Blue. Their refrain to me was “whatever makes you happy.”Little did they know how many tears I would shed being so afflicted with Cub Fever. I was a Cubbie-loving equestrian thespian, but as long as I was happy, who cared? I spent close to 20 years involved in the theatre in Chicago and made a few excursions to the East Coast. In the mid 80’s, I left the Windy City to travel and actually became a bigger fan than when I had been at home. Eventually I had to come back, and after a 12-hour car ride, I hit Wrigley on 8-8-88: the night that lights came to Wrigley. It was an omen, since I was coming back home to attend the School of the Art Institute of Chicago (and the School of Baseball at Wrigley). Within the week I was once again basking in the sunshine of the bleachers and soaking up the sounds and smells of the ballpark: freshly mown grass, combined with grilled hot dogs, balls caught by leather gloves, and dorky organ music. And, of course, let’s taunt Mets pitcher Roger McDowell. Win or lose, there was never a dull moment. At school I drove my professors crazy with my “affliction” for baseball. My man was Ryno, #23, Ryne Sandberg, and no one could tell me different. 95% of my art was baseball-themed, but then again everyone at that point seemed to be a Cubs fan…we were contenders and the city was going nuts. I took my beat-up Ron Santo glove and scanned in the trim to make my first computer-generated piece and I have never looked back. After 24 years I have made more paintings and pencil renderings than computer pieces, but they all shine like a big “W” flag. My subjects range from long-forgotten players like Chief Meyers up to Sammy Sosa’s corked bat. I rather enjoy the old timers, as they all seem to have been such characters—Three Finger Brown, Cool Papa Bell, and Leo the Lip. Two years ago, my buddy Ronny Santo passed away. I did the ugly cry in front of Wrigley and then the next year I did the happy ugly cry when he got into the Hall of Fame. 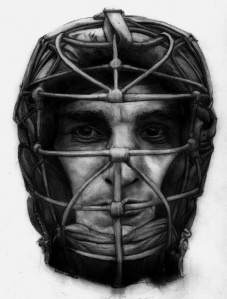 I made four more Santo pieces over those two years, the most I have done of any one player. But alas, there is more to baseball than my Cubbies. 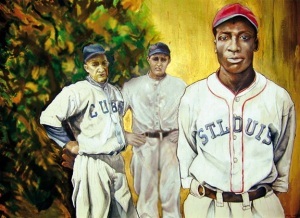 I have also painted and sketched Satchel Paige, the oldest rookie, a beatific Joe D., and my hero, Jackie Roosevelt Robinson. Robert Feller’s dad originated the Field of Dreams, building a park for his son, and I painted the family as “Baseball Gothic,” an homage to Grant Wood. What did Durocher do besides manage Willie Mays? Well, he loved to scream at umpires. So I painted it. The ideas poured out. 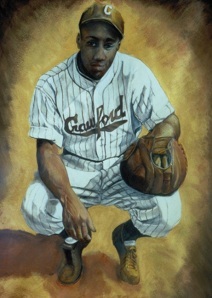 An idealistic Josh Gibson dreaming of the Major Leagues. Ted Williams’ smirk, which was almost as pretty as his swing. 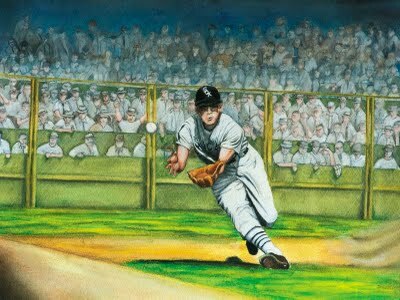 The iconic catch of Mays diminished against a wall of green. Ernie Banks, who still has the gold tooth he had when he played with the Kansas City Monarchs, and Hack Wilson’s golden bat spraying RBIs all over the field. 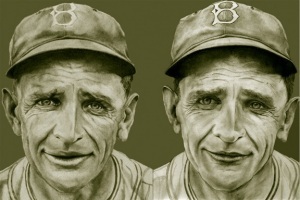 From Christy Mathewson to Monte Irvin to the greatest face in all of baseball, Casey Stengel, they are all in my portfolio. I have shown my work in various places over the years. If you are in San Francisco, I have pieces in George Krevsky’s gallery, part of a baseball art show that will get you singing during the seventh inning stretch. Of course, art means much more if you share it. Many of my works still await a home. Come by and look at what I’ve done. Buy a painting or a print and I guarantee I will use the moolah to buy a ticket to the greatest ballpark in the world…Go CUBS! Please make sure to check out Margie’s official website. It’s new and hot!!!! I was born in 1957 in Chicago and lived 3 blocks from Wrigley Field. 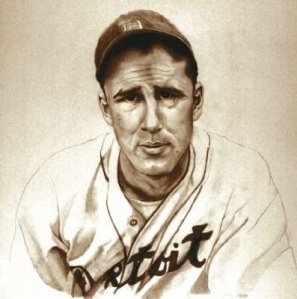 Both my parents were artists and influenced my right brain.My interested in baseball is a longtime fascination. In 1967 I used to play with the Little league boys but was not accepted as a member of the official lineup. I guess having estrogen coursing thru my pre-adolescent veins is a detriment to a good curve ball.During the baseball season of 1969 I was glued to WGN. Billy Williams was the most gorgeous man on this planet. Ron Santo punched out Leo the Lip in the locker room and I still use Ernie’s line with my boyfriend. AND I !#&%$$ hate the Mets………. Since 1988 I have attended at least 800 Cub games, 99% in the bleachers, no small feat since the price of a ticket has gone up 250% since my 88 bleacher debut! 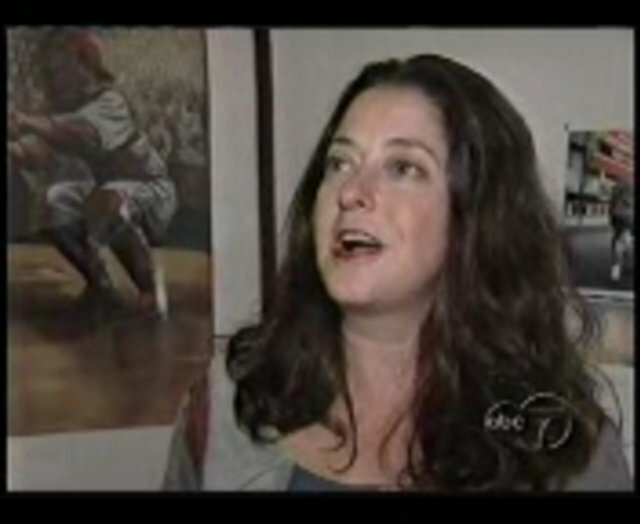 My paintings are in private and public collections – the Sun Times Building (can you believe it no Tribune/Cub sponsor! ), The Baseball Hall of Fame – Cooperstown, Murphy’s Bleacher, and my Mom’s refrigerator. My other interest is the survival of New Orleans as a city and a bastion of what our cultural heritage has to offer. The city of New Orleans should be designated a national treasure and every effort should be made to preserve and protect it’s soul as well as it’s infrastructure. Posted on June 9, 2012, in The Rest: Everything Baseball and tagged art, artist, baseball, chicago cubs, cool papa bell, fergie jenkins, josh gibson, margie lawrence, mlb, roger mcdowell, ron santo, Ryne Sandberg, sammy sosa, sandy koufax, willie mays. Bookmark the permalink. 1 Comment.